A handmade journal is a wonderful gift, also to oneself. In the times of multiple options of devices for writing down ones thoughts, ideas, dreams or prayers, there is a crave for real paper and pen... real stuff you can touch. A journal can be a faithful companion... next to the beloved phone. And can be an inspiration to write, in itself. So why not making one? I am not gonna give exact instructions, but rather the principle. You can modify it to whatever you want. The basics stay the same. Take five sheets of paper at a time and fold them in the middle until you have a pile of 8,10 or 12 .. or however thick you want your journal to be. It is only important that it is a round number. Then take each pile and pre pinch the holes for the sewing. It is good that they are in the same distant on every pile. Here as well, it needs to be a round number of holes. Now the sewing (the threat should be not easy to rip and as long as your paper piles are high times the number of piles you have). You start sewing from the outside in and have to get out in the end again, the threat simply goes through, so you are able to stretch it. Make a knot in the beginning. Then take the next pile, they have to be just next to each other. Your threat should be outside, so you attache the next one from the outside in again, go all the way through and attach the next from the top again.In the end it should look like an harmonica, always attached on the opposite side, but not yet together. Make sure you stretch it well in between, so it is really tied. The threat simply goes through all the holes and all the piles in one line up and down, so you are able to stretch it. Once you are through connect the spots, where you see the threat going from one pile to the next, simply with the threat by going through it once. Keep it tied and tie a knot. Cut the threat and do the same on the bottom, by first tying your threat to one side and then going through and tying it together there as well. This part might be a bit tricky, but as long as you somehow tie it together, and it is tight in the end, you are doing good. The heart of your book is now almost ready. Now take your ribbon and move it under the row of threats that is on the back of your journal. You should do three. This will help you attaching it to the cover later. What will keep your book together more is to apply glue generously on the spine. Keep the papers tied in that process. If you don’t have a hot glue gun, where it stiffens quick, you can use normal glue, but then you have to place your journal in between something very tightly, so the glue dries well and the journal is tight. Moving on to the more fun part: the cover. This is the outfit of your journal. You could do whatever you like here. I will give you the simple basics here. I’ve done a lot of different kinds and it is fun to come up with new cover designs. For this one I simply used two hard cardboards that are about 5 mm higher and 5 mm wider then the journal body. For this I used paper from an old Atlas. I love maps. And this was a journal for a guy. So nothing girly possible. I simply glue that paper on the cardboard and as a connection of front and back cover, I used a strip of canvas, which I glued on as well. The middle, or the spine of your journal, needs to be movable. You can also use a thin strip of hard cardboard in between the front and back cover, to get a hard spine, then you can use tape (like gaffa tape, or masking tape) in between the cardboards and the spine to keep it movable. And in the end you can cover it with fabric or paper. There are so many different ways! If you want a bookmark, you can glue a ribbon on the spine as well. So, now you should have the paper heart of your journal and a beautiful cover. Let’s combine those two. 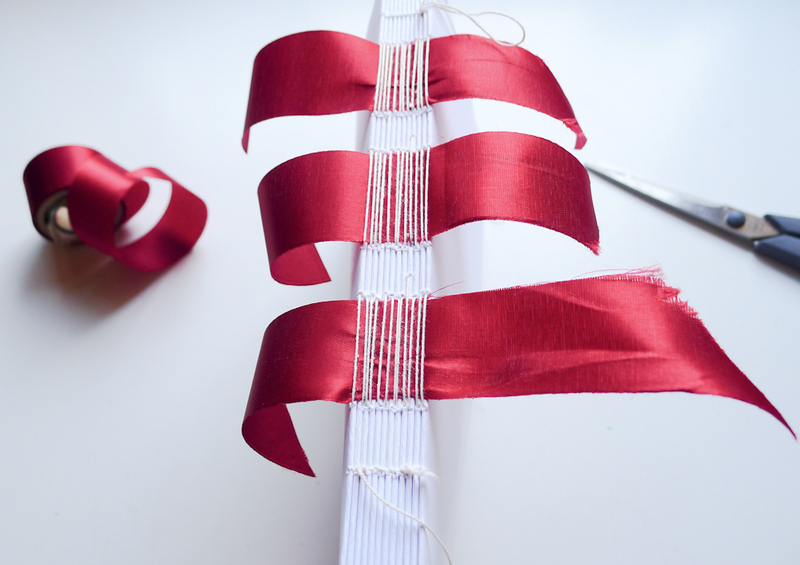 Glue the ribbons on the front and back of your cover from the inside. It’s important that you can still fully close your journal and open it. Try out where you have to glue it, so it is in the right position. After that you need an inside paper. This is like clothes under a coat, otherwise it looks naked. I recommend to use something thicker, then what I used, so it looks nice and clean... That paper, needs to have a size to cover the first page and the cover from the inside, so it should leave 5 mm on the edge of the inside cover. You can also not glue it over the whole first page, but only 1 cm on it’s edge, if it is a thick paper. Now your journal is fully dressed. Nice job. I hope, you or whoever it is for, will enjoy it.